According to latest figures, Ealing's got the highest number of households registered to vote in London. The proportion of the borough’s households registered is 98.2%. “It is great to know that so many of our residents will be able to exercise their democratic right to vote in the elections. Being registered does not mean you have to vote – it just means you can. 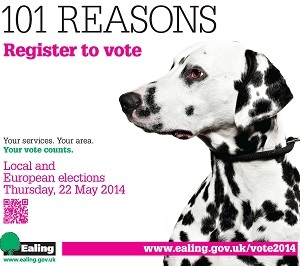 Ealing residents must be registered by Tuesday, 6 May if they want to have a say in the local and European elections. Anyone who is not already on the electoral register should visit www.ealing.gov.uk/vote2014 for more information or email elections@ealing.gov.uk. The local/European elections are on May 22nd.